I am working through examining the inexorable passage of time, employing the movement of my body in and through space. I utilize the inherent similarities between the way that glass and the weight/mass of the body react to the forces of time and the pull of gravity.​ Having a background in both Dance and Craft, movement is an intrinsic aspect of my relationship with materials. My work interrogates what it means to have a body. Is the space between my limbs considered my body if my body is what defines it? How does adding myself to a space change its dimensionality. I am concerned with the passing of time and finding ways to quantify it through materials. Whether that be through the trace forms of my movement, the space my body occupies, or archiving the passage of time, I am constantly grappling with my bodies impermanence. I view the steps of making a glass object (for example a cup) as choreography. There is a certain way the gaffer moves and navigates the hotshop when working with hot glass. It’s muscle memory that is learned through repetitive action. The way the glass reacts to each gesture of the body captivates me. Every move I make is translated directly into the material. Fluid like water, or rigid like ice, I am constantly fascinated with the competing materials competing characteristics. ​Rooted in craft, I understand glassworking (in all forms) as a dance or means of accessing what curator Glenn Adamson refers to as “no mind.” The act of making takes me to a place in my mind where I am thoroughly completely at ease. Time seems to dissipate and I am no longer important. I long for this mental state of emptiness; where I become completely present in the moment. Everything I experience is connected through process. and the repetitive movements of making become ritual thus defining my craft. My practice becomes a deep quest of the self, where I interrogate what it means to be human, or to be conscious at all. ​ Emily Kuchenbecker was born and raised in Madison, Wisconsin. She received her Bachelors of Fine Arts from the UW-Stevens Point, with an emphasis in Glass. Emily is currently a first year graduate student in the Craft and Material Studies Program, at Virginia Commonwealth University. 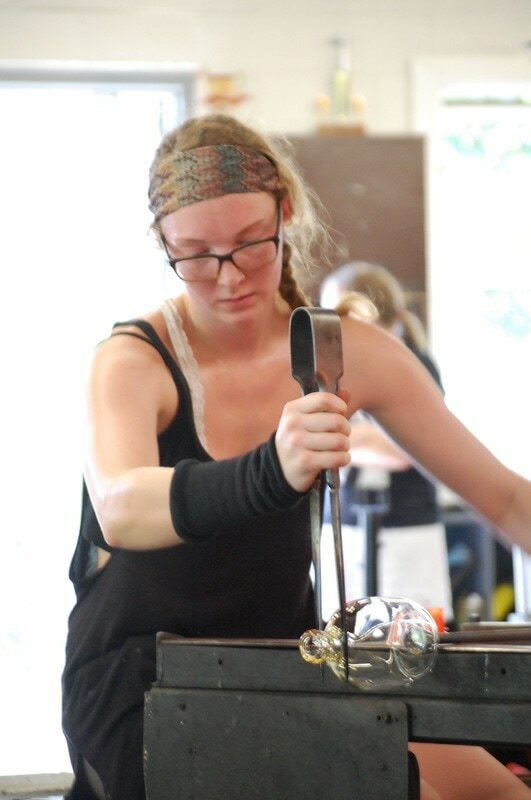 Emily has studied at the Pilchuck Glass Studio, Penland School of Crafts, and Oxbow School of Art, She recently attended the 365Haridwar artist residency in Haridwar India. Since 2016, Emily has continued to serve as the Co-Chair of the Digital Media Committee for the Glass Art Society.